The Outstanding Volunteer Awards Program provides recognition to those individuals who have been identified by their local genealogical organization to be honored for exceptional efforts. The Washington State Genealogical Society (WSGS) started this program, not as a competition between organizations, but as a means for societies or groups to give widespread recognition to their best volunteers. WSGS produces award certificates using brief narratives of accomplishments and digital photographs. The awards are announced at the WSGS annual meeting and conference, and the certificates are given to those honored volunteers who are present. Remaining award certificates are sent to the originating society for presentation. The narrative is also abstracted into the WSGS Newsletter and onto the WSGS website to show others around the state what good works volunteers do. 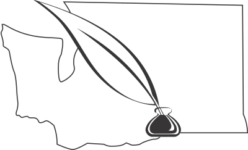 Generally, awards are given in two general categories: (1) for exceptional and consistent support of the goals and operation of their home society, and (2) for outstanding efforts in the identification, preservation, dissemination or publication of information of genealogical importance and value to researchers interested in the families of Washington State. TriCity Genealogical Society Board Award is given in recognition of “Extra Mile Service” to the Society and the community it represents. The Award will be presented at the November Annual Meeting to one or two persons when the Board decides a selection is appropriate. Pat Ballowe is recognized by TCGS for going the extra mile when she touched every book, microfiche and microfilm while updating the holdings list for the TCGS Library (see certificate). Linda Stephens is recognized by TCGS for going the extra mile when she helps the Publications Committee to resolve concerns & issues for each bulletin and proofreads the bulletin before release. She has also proofread many of the scanned indexes to the 52 years of TCGS bulletins in preparation for an All Surname index to our Bulletin (see certificate). Mikal “Mike” A. McKinnon of Richland, Washington, is recognized by WSGS for outstanding efforts in the preservation of important records of genealogical value to the Tri-City Genealogical Society and other researchers interested in the families of Washington State. Read more. Wilburn Lee Smith of Pasco, Washington, is recognized by WSGS for exceptional and consistent support of the goals and operation of the Tri-City Genealogical Society. Lee Smith is once again recognized for exceptional and consistent support of the goals and operations of the Tri-City Genealogical Society. Read more. Lee Smith, of Richland, Washington, is recognized by WSGS for exceptional and consistent support of the goals and operation of Tri-City Genealogical Society. Lee Smith distinguished himself in support of Tri-City Genealogical Society through his untiring efforts to contribute to the Society’s publications, to help ensure Society meetings run smoothly, and to assist others in their research efforts. He has served on the Society’s Board for many years, and assumed the position of Publications Committee Chair upon the resignation of his predecessor. Prior to this he had been the editor of the Society’s Bulletin, which is published 3-4 times per year. After a new Publications Committee Chair was appointed, Lee returned to the post of editor full time, performing this function almost single-handedly. He attends Society meeting with great regularity, getting there early to help set up and staying late to help put things away. He also is the guardian of the Society’s sound system and other equipment, making sure they are available at each gathering. This past spring, Lee led a group of researchers to use the Family History Library in Salt Lake City. For several days he helped the handful of members to use the Library’s resources to best advantage. Lee is a tremendous asset to our Society. His constant support and many hours of labor have helped ensure the Society’s success.